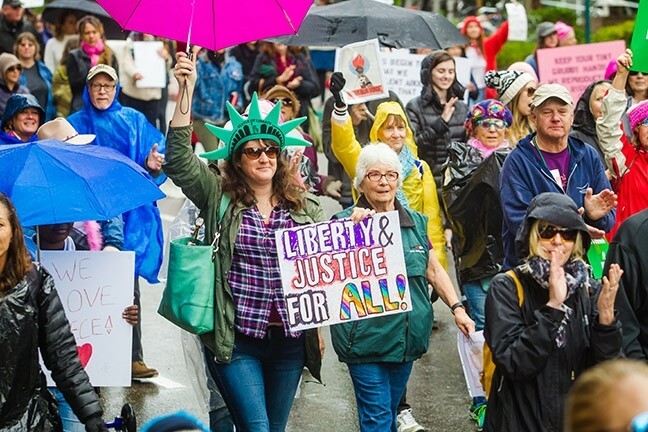 When a group of organizers in SLO decided to hold a march in solidarity with large demonstrations scheduled to take place in Washington, D.C., and other major American cities, they expected a small turnout of about 200. Held the day after the presidential inauguration of reality television personality Donald Trump, the national women’s march movement was an outpouring of concern, a show of solidarity, and a beacon of hope for women, people of color, immigrants, and others who felt vulnerable and targeted by the incoming administration. On that day, the SLO marchers joined more than 4.9 million others worldwide, participating in one of the largest protests to ever occur in the United States. ON THE MARCH: The SLO Women’s March drew thousands and helped spark a renewed interest in political activism in SLO County. After it was all said and done, Women’s March SLO organizers like Dawn Addis sat down and asked themselves a very important question: What do we do now? “We had a dinner where we kind of got together and had to decide if we are in this for the long haul, or it was a one-off,” Addis said. The answer was obvious to anyone who came to Mission Plaza on Feb. 1. Just 11 days after the march, Addis and the group’s other members organized a vigil to support Muslims and refugees targeted by Trump’s recent executive orders. The event drew more than 300 people. As she stood handing out candles to attendees, Addis said the choice to continue was a no-brainer. The organization’s efforts are a new chapter in a surprisingly long history of women spearheading large political activist movements in SLO County, from as far back as the women’s suffrage movement of the late 1890s to the massive protests against the Diablo Canyon Nuclear Power Plant in the 1980s. Today, Women’s March SLO and other local groups are looking to carry on that legacy, and turn the post-election anger and anxiety into solidarity and a drive for local, state, and national change. Today, the SLO Women’s March has an email list of more than 7,000 people and a little more than 3,200 followers on its Facebook page. That’s thousands it can reach out to and call on to support action and activism in the community. It’s a ready-made pool of motivated area residents Women’s March SLO called on to bring hundreds to the vigil. 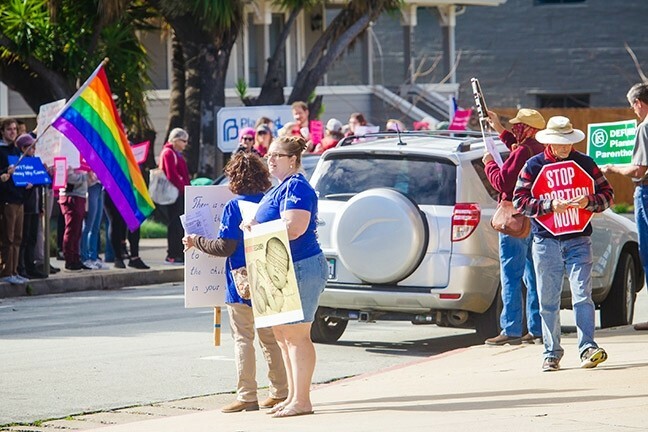 It called on this pool again when it partnered with other area organizations to support a more than 700-stong silent counter-protest to a demonstration against SLO’s Planned Parenthood. Members also showed up in force to a recent town hall meeting hosted by Republican Assemblymember Jordan Cunningham, and are organizing local participation in a national “Day without a Woman” protest March 8. And it isn’t just the Women’s March that’s reaping the benefits from a renewed interest in protest and activism. Galvanized by their concern over the actions of the Trump administration and bolstered by the energy and momentum of the mass protests, an increasing number of SLO residents, including veteran activists and newcomers, feel called to get involved and take action on a local and national level. SPEAKING OUT: Many of the recent protests in SLO were direct responses to actions taken by the newly elected administration of President Donald Trump. The wave of protests began almost as soon as the election ended. On Nov. 12, 2016, hundred’s of SLO residents took to downtown to march against Trump. After the Women’s March in January 2017, the public demonstrations continued. On Jan. 31, Cal Poly students rallied against a visit by white-nationalist darling and “alt-right” Breitbart ex-columnist Milo Yiannopoulis. On Feb. 2, a crowd of about 100 people gathered in Mission Plaza to show support for the proposed Chumash National Marine Sanctuary and speak out against offshore oil drilling. That demonstration was organized by the SLO Progressives, a rapidly growing club formed by former supporters of populist presidential primary candidate Sen. Bernie Sanders (D-Vt.). The progressive group emphasizes taking action that has a direct impact on the local community. Tarrah Graves, secretary for the SLO Progressives, said the organization’s membership grew rapidly in the wake of the election and subsequent protests. The group’s first three meetings had just 15 to 20 people in attendance. At its most recent meeting, the venue was too small to hold everyone who showed up, leaving some waiting outside in the rain and trying to get in, according to Graves. It’s those individuals seeking to “do something” who have allowed the group to rally its supporters in large numbers. The group turned out hundreds of local progressives to elect 14 of its own members as delegates to the Democratic Party, within which they can work to shape the party platform and endorsements on the national level. Twice since its formation, members of the group packed a SLO County Board of Supervisors meeting to speak out against actions by the board’s three-member conservative majority. KEEPING IT LOCAL: Organizations like the SLO Progressives hope to channel renewed interest in activism into local causes, like opposing offshore oil drilling on the Central Coast. Courtney Haile—co-founder of R.A.C.E. Matters SLO County, a nonprofit activism group that focuses on issues of racial and social justice—said she’s also seen an uptick in the interest about her organization since the election, particularly after she was invited to speak at the Women’s March. Post-march, Haile and R.A.C.E. Matters are practicing what they preach and participated in the sold-out “get to know your Muslim neighbor” event in SLO, as well as Change the Status Quo, an annual social justice conference held at Cal Poly. While the Women’s March and subsequent protests in SLO continue to make headlines, it isn’t the first time the county has been caught up in a wave of political activism. 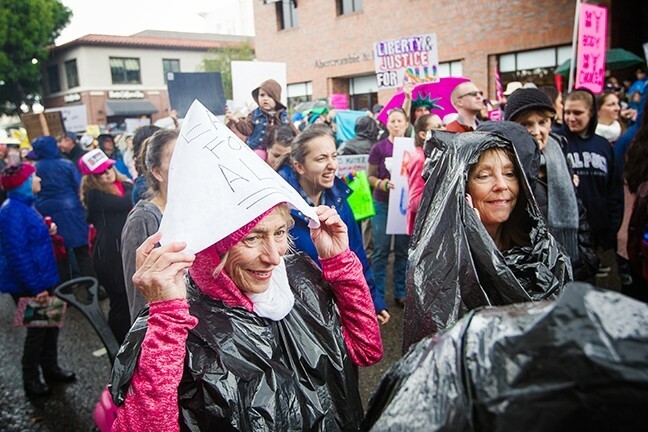 BAD WEATHER, GOOD VIBES: Thousands of men, women, and children braved the rain to turn out at the SLO Women’s March Jan. 21, joining an estimated 4.9 million others participating in similar marches in the U.S. and around the world. It wasn’t just the barnstorming suffragettes from other states who rallied the pro-suffrage movement in SLO. Local residents, many of them women, used grassroots organizations like the Farmer’s Alliance, the Women’s Christian Temperance Union, and Political Equality Clubs to push men to vote for suffrage at the polls. In the 1896 election, 54 percent of SLO County voted in favor of allowing women to vote. The measure failed at the state level that year, but was eventually passed in 1911. 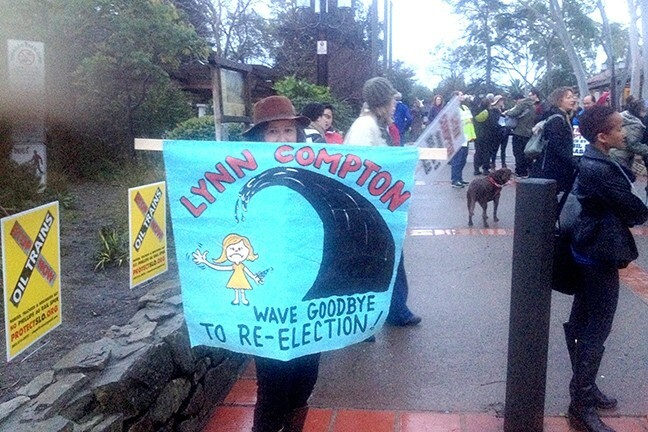 Less than 90 years later, SLO County would again become a hotbed for protests and activism, this time centered on the Diablo Canyon Nuclear Power Plant. In 1981, a group called the Abalone Alliance organized a two-week-long blockade aimed at stopping construction of the then-unfinished plant. Reports from the Los Angeles Times stated that thousands of protesters turned out at the gates to try and stop workers from entering, resulting in nearly 2,000 arrests. The blockade eventually ended and construction continued. Three years later, the plant was scheduled to come online, sparking a new wave of protests and vigils from activists. Longtime SLO resident Linda Seeley was among them. Seeley, who cut her teeth protesting the Vietnam War, had recently moved to SLO and was alarmed at the possibility of the plant, which she believed was a danger to the environment. Seeley immediately began working with the Abalone Alliance. “I found they were a very focused and capable group of women who were highly aware of what was going on at Diablo Canyon,” Seeley said. 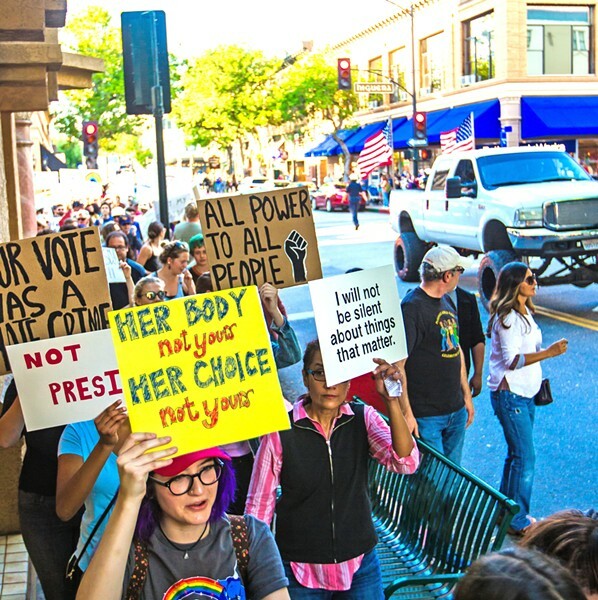 IN IT FOR THE LONG HAUL: After the success of the Women’s March in SLO, local organizers and groups have been working together to carry on its momentum, including organizing a 700-person silent counter-demonstration to a protest of SLO’s Planned Parenthood. Seeley, a working mother at the time, was a member of one of several “affinity groups,” small gatherings of activists who would meet and organize actions or activities. Seeley’s group, called Oaks and Acorns, was primarily made of families with children. Seeley said the members of the group formed deep friendships, and many of them remain her friends to this day. While Diablo eventually went online, Seeley continued her activism, joining Mothers for Peace, which today still lobbies for the plant’s immediate shutdown. Seeley participated in the SLO Women’s March and said she was happy to see so many people attending what she characterized as an “uplifting” protest. She felt it echoed the motivated energy that fueled the protests against Diablo in the 1980s. Seeley said it was particularly inspiring to see young people, young women in particular, out marching. If you are looking for an example of the next generation of activists moved to action by the election, look no further than 18-year-old SLO High grad Bella Stenvall. THE TRUMP EFFECT: The election of Donald Trump triggered protests in SLO and across the country. After spending the summer abroad and volunteering in a Syrian refugee camp in Greece, Stenvall is now living in Washington, D.C., where she works as an intern for 24th District U.S. Rep. Salud Carbajal (D-Santa Barbara). Stenvall was one of an estimated 500,000 people who participated in the Women’s March at the nation’s capital. She said the sheer size of the crowd that turned out was inspiring, especially in light of the fear and anxiety many women, minorities, immigrants, and others marginalized groups were feeling after the inauguration of President Trump the day before. She didn’t stop there. Since the march, Stenvall said she’s continued to attended protests and rallies, connecting with other passionate activists both in person and online. 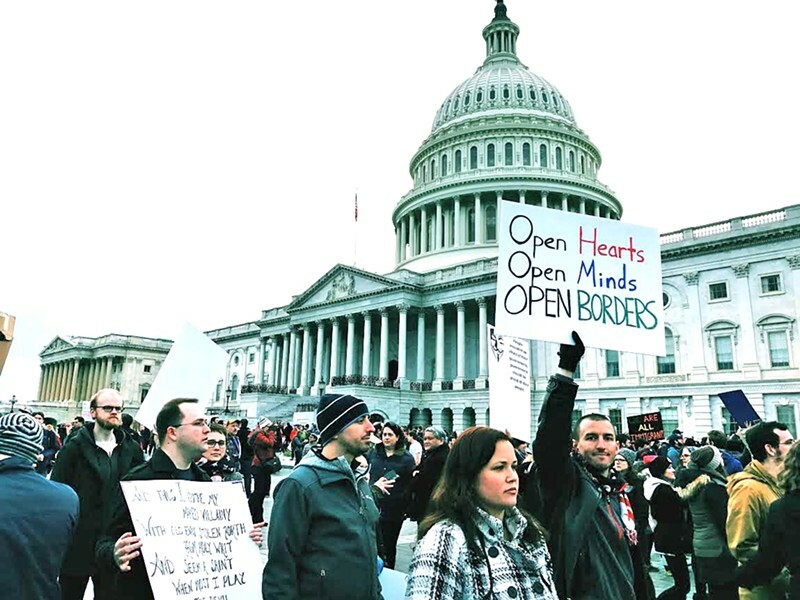 On Feb. 4, Stenvall spoke in front of the White House to a crowd of hundreds of protesters gathered to oppose the recently signed ban against individuals and refugees from seven predominantly Muslim countries. On Jan. 23, she participated in a rally to encourage more women to run for office. Taking direct actions, large or small, has become part of her everyday life. Similar to SLO, Stenvall said that D.C. has seen a renewed interest in activism and protests. There are many, many others like her. FROM SLO TO D.C.: The rise in activism and protest in SLO is part of a larger national wave of protests sweeping the country after the 2016 presidential election. 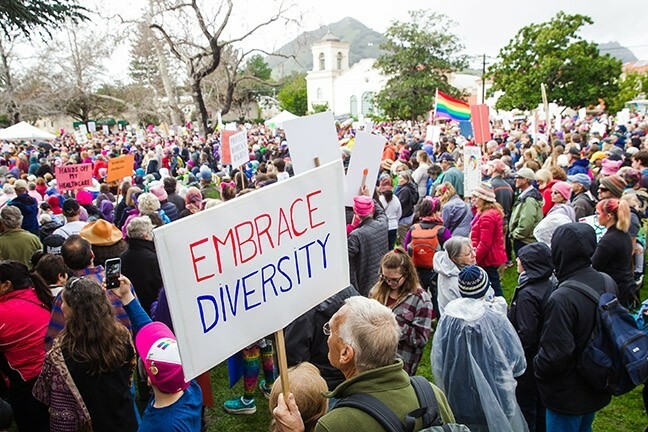 On the Central Coast, groups like the Women’s March SLO, the SLO Progressives, and others are trying to welcome energized newcomers into the fold. In part, they hope to show them that large marches aren’t the only way to contribute to the cause. Small and measurable actions that work toward a larger goal are often the stepping stones that make a one-time marcher into an everyday activist. Women’s March SLO encourages members to participate in a national strategy asking members to take on small goals, such as sending letters or making phone calls to their representatives opposing the president’s cabinet nominees and executive orders. The march’s members are also forming “huddles,” small gatherings similar to the affinity groups Seeley participated in, which will set short- and long-term goals on specific policy issues. The SLO Progressives have a similar approach. Its website features an “action center” that provides information on how to call senators and other representatives or write letters to the editor to area newspapers. In addition to getting members out to the Board of Supervisors meetings, the group also got members to write and mail 500 postcards to state representatives for the Democratic National Committee in support of naming Rep. Keith Ellison (D-Minn.) as the Democratic National Committee’s national chairman. Haile, of R.A.C.E. Matters SLO, echoed a similar sentiment. Increasingly, those different causes appear to be banding together in SLO. The Women’s March SLO, SLO Progressives, and the other individuals and organizations under that “progressive umbrella” have been networking more often since the election, creating a broader coalition of support. As burgeoning activists continue trying to make progress in SLO and across the United States, the question remains about just how much of an impact they can make, and how sustainable their efforts are. 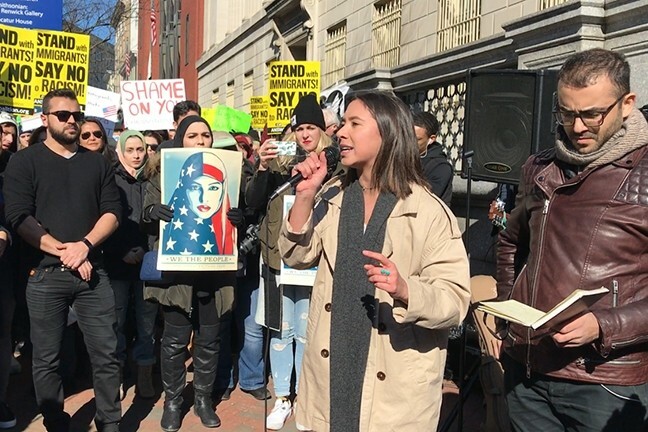 NEW VOICES: San Luis Obispo High School graduate Bella Stenvall addresses protestors at a Washington, D.C., rally in support of Muslims and refugees. So far, there are some promising signs for their movement. After mass protests at airports across the country, the 9th Circuit Court of Appeals issued a stay on the controversial travel and refugee ban. After a tidal wave of phone calls, letters, and emails, Senate Democrats fought Republicans to a draw and nearly stopped the confirmation of Education Secretary Betsey DeVos. Soon after, Trump secretary of labor nominee Andrew Puzder pulled his name from the Senate confirmation process. Haile said she was cautiously optimistic about the early successes, but noted that the work of achieving long-term goals means continuing the momentum of large public outpourings like the Women’s March over the coming weeks, months, and possibly years. Veteran organizer Seeley agreed, and said that continued progress will come from the nitty-gritty and less glamorous organizing work that comes after the marches and protests. 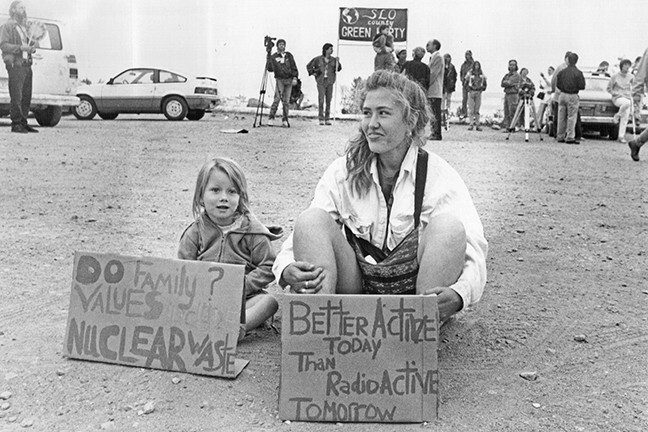 A BLAST FROM THE PAST: Crowds of activists work to stop the Diablo Canyon Nuclear Power Plan from opening in the 1980s. That “tedious” work—the phone calls, the letters—has an impact, according to activist and congressional intern Stenvall, who said the recent wave of collective action is having an impact in Washington, D.C. Her boss, Rep. Carbajal, agrees. “This is an unprecedented time that calls for unprecedented engagement of our constituents to be heard and to create a critical mass of concern in the face of policies that we disagree with,” he said. Those who seek to maintain that critical mass still have a long and uncertain road ahead of them. The success of their efforts, and the result of their work and organizing and activism, remains to be seen. Seeley knows better than most that that road is not always easy, nor is victory always guaranteed. Still, she insists that the fight is worth it.